Staten Island, NY | Head Coach Michael Mauro and the College of Staten Island baseball program is proud to announce the celebratory signing of two outstanding seniors from New Dorp High School, Kevin Ryan and Nicholas Dedato. The pair are promised to complement a healthy CSI recruiting class that is expected to yield big dividends. Ryan is enjoying a sensational senior season with the Centrals and is a Public School Athletic League Scholar-Athlete and All-Star. He has been a varsity pitcher since his sophomore season. He is looking forward to staying local and competing on CSI’s regionally powerful program. With over 40 innings logged this season, Ryan has walked just 11 batters next to 60 strikeouts, boasting an impeccable 1.05 ERA. He was also a member of the Cadets Baseball Club. The son of Kevin and Stacey Ryan, Kevin is a member of New Dorp’s Honor Roll. He has an older sister, Marisa. 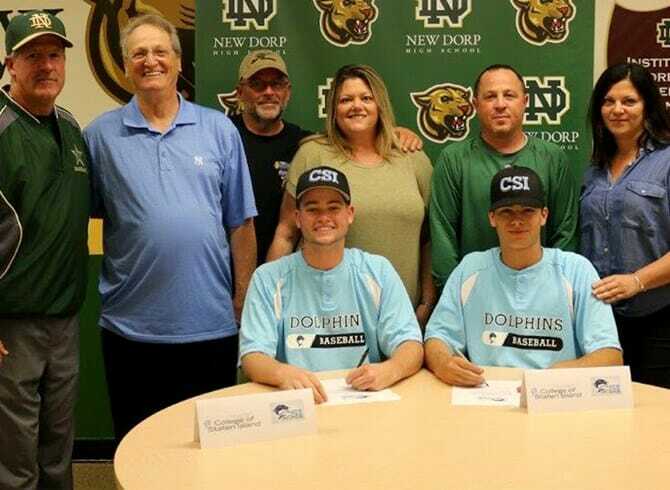 His teammate, Nicholas Dedato, is expected to play a role in the Dolphins outfield next season, as Dedato has spent most of his time with the Centrals patrolling left field. There, he won his school’s award for Outstanding Defense, something that will surely help him acclimate to the college game. Batting over .400 his junior season, Dedato is also a member of the Richmond County Baseball Club. Son of Danny and Janine Dedato, Nicholas is a Certificate of Academic Merit award winner at New Dorp. He has two siblings, Christian and Jessica. Christian plays lacrosse with the Centrals currently. The CSI Baseball squad recently finished their 2018 season with a record of 18-16, finalizing the season in dramatic come-from-behind fashion to win the CUNYAC Postseason Championship, their 20th overall and fourth-straight. They graduated six seniors this past season, so the Centrals pair will be expected to fill a strong void.